Gary Craig developed Emotional Freedom Technique after having studied Though Field Therapy with Dr Callahan back in the 80s. He pared down what he had learnt from Dr Callahan to the bare bones and in doing so created this beautifully simple technique which is accessible to just about anyone. It is a simple to learn and easy to use technique which is based on the Eastern understandings of the body’s Energy System and how it affect us Emotionally and Physically. Our bodies have a whole network of ‘Meridians’ or channels of energy that course through the body. When we develop a disruption in one of these Meridians, we begin to experience the associated negative emotions, which left unchecked can begin to affect us. Disruptions usually occur when we suppress an emotion, which most of us have learnt to do very efficiently. We can all identify an emotional or physical condition (disruption in the energy system) but what do we do with it then? The principal of EFT is that by sending a pulse of energy in the form of Tapping on 14 easily found Meridian points, whilst paying attention to the issue, will clear away the disruption, often permanently. Physical symptoms can also be addressed using this method too, which is great for bringing relief to all types of short and long term conditions. The key to success is to allow yourself to be as honest and candid about how you feel (emotionally or physically) as you can. Every time you feel an unwanted feeling, it is only when you acknowledge it in your thoughts do you realise that you are feeling it. So, for instance, you may be feeling a little down but it’s only when you suddenly think to your self ‘Oh I’m flat as a dab today’ that you acknowledge that that is how you are really feeling. So if I asked you to gauge just how flat you are feeling on a scale of 0 – 10 (10 being completely flat) what number would you give the feeling? The higher the number the more intense the feeling. So now you know what it is that you are feeling, how you acknowledge it, and how strongly you feel it, the next thing to do is create your statement. You begin by creating your Set Up Statement by sandwiching your words with ‘Even though…………….I deeply Love and accept myself. ‘Even though ‘I feel flat as a dab I deeply Love and accept myself’ Do your best to stay focused on the ‘feeling whilst you tap. Now whilst you repeat your Set Up Statement 3 times, you simply tap the side of your hand with the index and middle finger tips of the other hand. 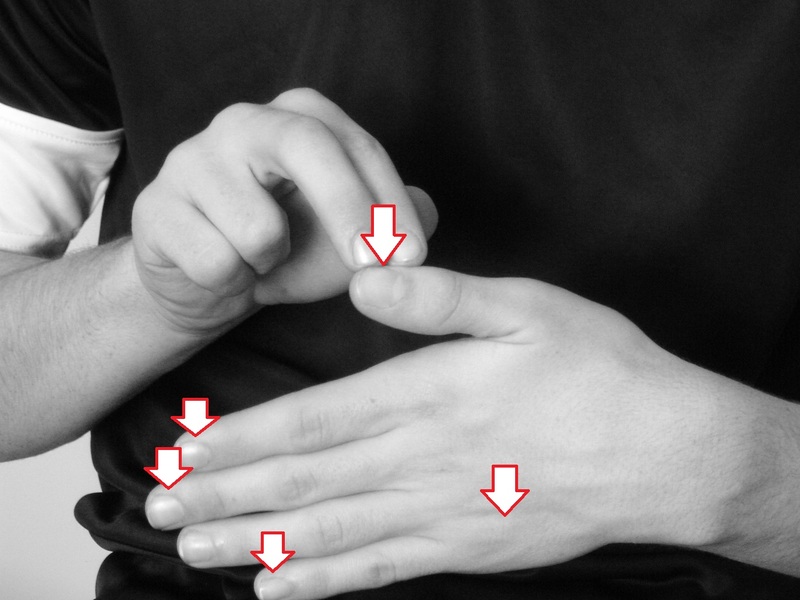 Next, using the same two fingers, begin by tapping each of the following points 5 – 7 times. Beginning with eyebrow above the nose whilst repeating the words you included in your statement. e.g. ‘Flat as a dab’. 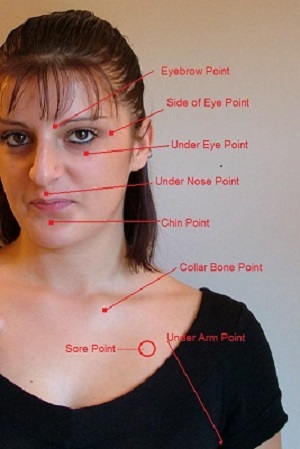 Then move onto the next point, Side of the eye, and repeat ‘Flat as a dab’ and so on until you have tapped on all the points shown in Figure 2 below. Now, using the same two fingers, begin by tapping each of the following points 5 – 7 times starting with the Thumb whilst repeating the words you included in your statement. e.g. ‘Flat as a dab’. Then move onto the next point, Index Finger, and repeat ‘Flat as a dab’. Middle Finger next, and repeat. You can skip the ring finger and go onto the Baby Finger and repeat. Finally, the Gamut Point which is located on the back of the hand, between the bones of the ring and baby finger. See Fig 3. Hum a couple of bars of a simple tune. Well done!!! You have just completed a full round of the basic recipe of Emotional Freedom Technique. So….What could you try this on? If you have any questions, why not give me a call now on 0800 6118 124 for an initial chat or email me via my contact form with ‘EFT’ in the subject line please.